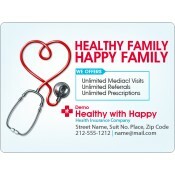 Promotional health insurance magnets are perfect for health insurance services trying to position their business information over easily visible areas. 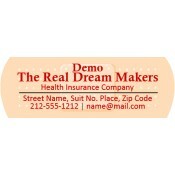 These advertising insurance magnets are perfect gifts year round because people love to retain them on their refrigerator doors. We offer attractive price savings on wholesale orders of these promotional magnets which allows insurance marketers to seek them for tradeshow giveaways or bulk mailing. Health insurance marketing is a challenging and difficult task because health insurance services are trying to push their services hard. There is a common misconception that health insurance marketing means promoting insurance products, however, it is not true. 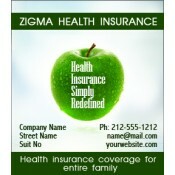 It is more about building trust in a particular health insurance program and attracting clients. Today, with so many health insurance services and professionals entering into the industry, the existing businesses are compelled to adopt personalized approach. 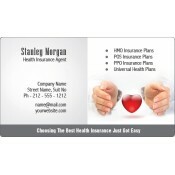 Insurance services have always relied on business cards, calendars, caps, notepads, pens, flyers, newspapers advertisements, online advertisements and many other marketing strategies. However, there is no one strategy which may work equal for all businesses because insurance marketing is not “one size fits all”. It is seen that insurance companies are seeking various ways to keep in touch with their customers more aggressively than before. By now, they have relied on mails, personal interactions and advanced mobile applications for offering enriched user experiences. 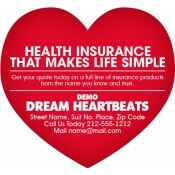 Many insurance companies are investing in colorful health insurance magnets because they know it will allow them to forge personalized relationships with their clients without disturbing their budget. People would love to retain colorful customized refrigerator magnets over their refrigerator doors. 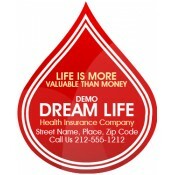 We offer attractive price savings, free art setup, free online design proof and free shipping with all our promotional magnets which further aids insurance services to cut down their investments. Being built on popular sizes of promotional rectangle and square magnets and other shaped magnets, insurance agencies and consultants can expect their long-term visibility. To know more about price savings, customization, shipping and other details of these customized magnets, feel free to contact us at 855-762-4638 or write to us at info@cmagnets.com.